Spring tulips remind us of the pleasures in life. They are fresh. They are beautiful. They remind us of love. 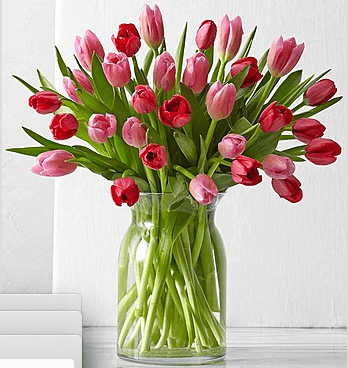 Tulips were the original flower of Valentine’s as they were to have symbolized love and joy. This large glass vase arrangement if just full (approx. 30) of the best tulip blooms to tell them how you feel. It’s spring. I love you.